The Fiocchi brand name has become synonymous with affordable excellence for many American shooters. 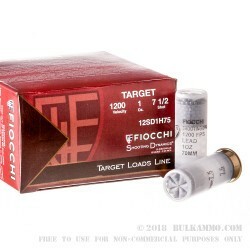 These 12ga target loads by Fiocchi offer precision, power, and accuracy that rival many higher-priced shotshells. 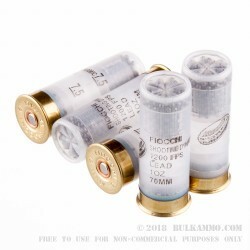 Fiocchi loads their 2-3/4" shells with 1oz. of #7-1/2 shot. 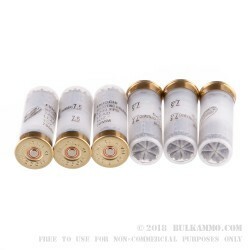 These 12ga shells will slay clay pigeons and targets within 50 yards, and the recoil is modest enough that novice shooters can practice without the shoulder pounding recoil normally produced by 12ga shells. 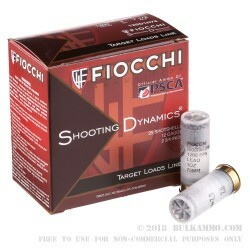 Fiocchi is headquartered in Lecco, Italy, but their plant in Ozark, MO makes their ammo easily accessible and readily available to American shooters. If you haven't tried Fiocchi ammo, this 25 round box is a low-risk selection to start with. Order your 12ga ammo by Fiocchi today!